- The expansion joints are designed, fabricated and tested to provide an accurate and effective solution to the customer's requirements. We are engaged in manufacturing and supplying a supreme quality Food Grade Bellow. This food grade bellow is perfectly manufactured employing highly updated technology and quality proven material. Keeping in mind the diverse requirements of our clients we are involved in offering an extensive range of Rubber Bellow. We manufacture under the strict guidance of our experts using fine quality material and advanced technology. Offered product is widely used in fluid filling system, hydraulic ram protections and many more. 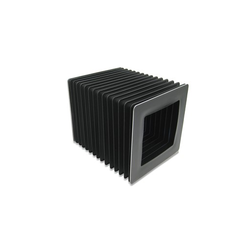 These Rubber Bellows are perfect for protecting shafts, shaft joints and movable parts of machines. Rubber Bellows for Automobile & Industrial applications are extremely flexible as required in its application. Can be made in NBR, SBR, EPDM, SILICON, VITON etc. We design and develop different types of flexible Rubber Bellow & Boots made from high quality rubber. These are available in variations of sizes and shapes which can also be customized as per buyers’ requirements. 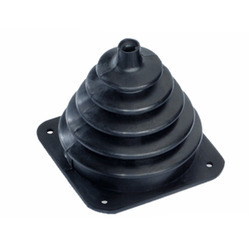 Our industrial rubber bellows are preferred by many reputed clients to cater to their industrial needs. Supported ourselves with proficient amenities, we are readily instrumental in providing an inclusive variety of Rubber Bellows.